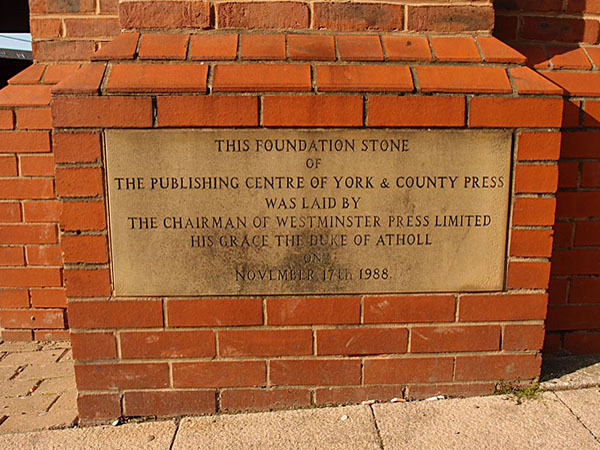 The foundation stone at the front of the Press offices on Walmgate, pictured on 3 June 2014. It proudly proclaimed that it was laid by the Duke of Atholl, in 1988. An enormous building grew up above it, for many years the home of our long-established local newspaper. Its size a reflection of the importance and authority of the established local press. Organisations and companies of importance had often provided a clock on the front of their buildings, as a useful service to the public, but it was perhaps less common by this time. 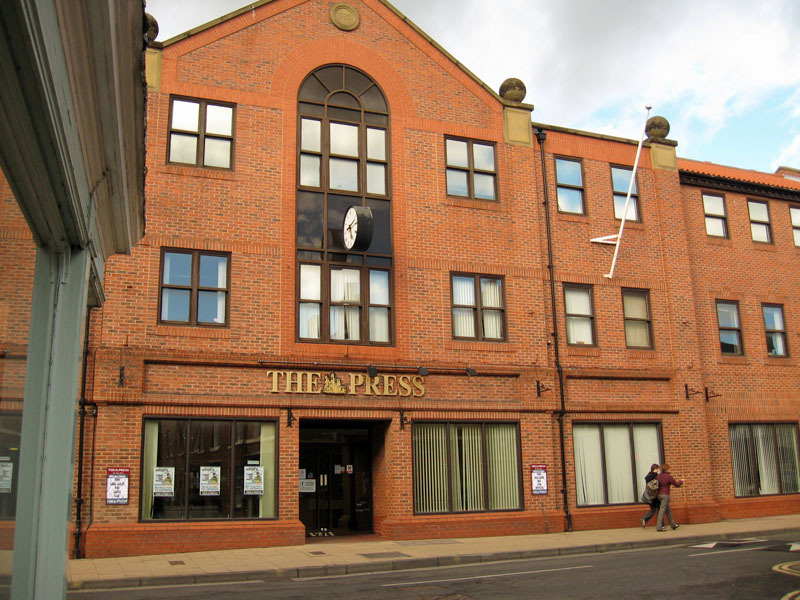 Still, the Press had one added to the front of its landmark building on Walmgate, in the late 1980s. That building was vacated last year, and has since been demolished. 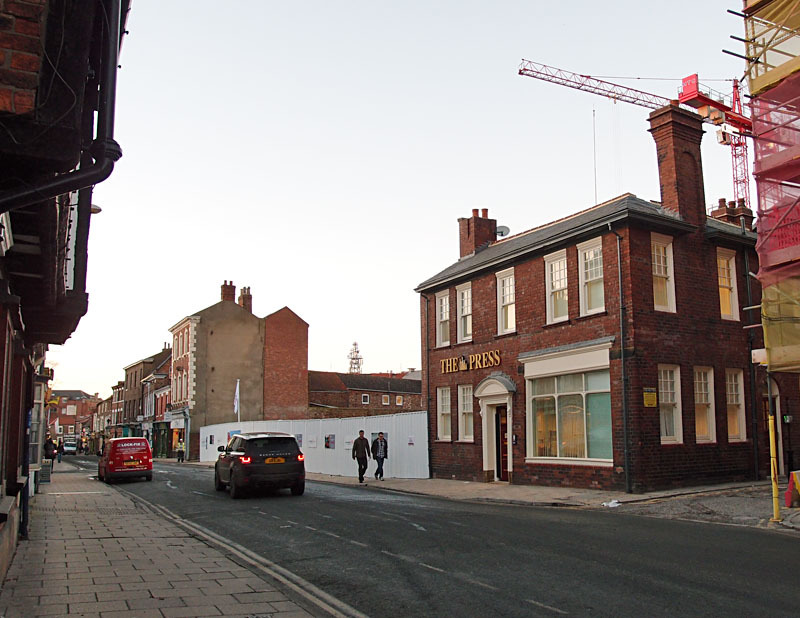 I went back down Walmgate in early December to see how things were progressing on the various building sites. It was one of those occasions when I felt like an alien suddenly landed in a completely unfamiliar terrain. It was difficult to recognise the place, where things had been. Enormous great gaps in the building line of the street with cranes behind and massive concrete things growing up in the spaces. And in the middle of it all, the new home of The Press in York. No foundation stone needed here, and behind them something called ‘Student Castle’ is taking shape. The new office is in an older and smaller building alongside the site formerly occupied by the 1980s building. This photo from that early June evening shows the two buildings together. Here’s the gap the demolition left in the streetscape of Walmgate. Pictured on 3 December 2014. 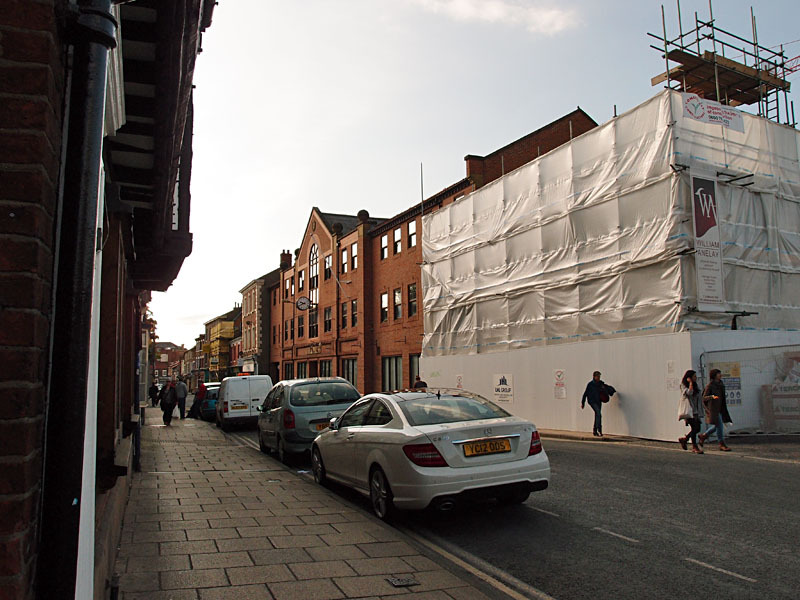 Our local Press is shrinking, changing, while all around it changes too, but a smaller staff team still reports on local news and views from this office between building sites in the middle of the barely recognisable Walmgate. Every few months we seem to hear about more redundancies at the Press. Experienced professional journalists and photographers are found to be surplus to requirements. 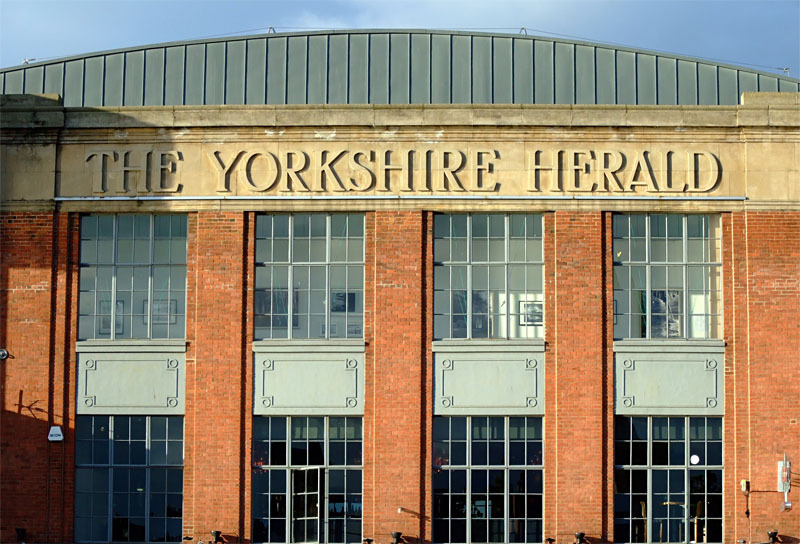 Most recently, last week, managing editor Steve Hughes was replaced, as Newsquest group merged the editorial operations of their York and Bradford papers. Some distance from Walmgate, in the heart of the city, close to the Guildhall, a reminder of the heyday of the local paper as a printed thing everyone bought a copy of. The internet has changed everything. We’re still keen for news and keen to devour content on local happenings, but we can get it for free online, from the website of the Press in York or from numerous other sources. Print sales of the local paper must be a tiny fraction of what they were. So the main source of income to pay the professional journalists must come from advertising. Which is why the ads on the website get bigger and more frequent and more intrusive. 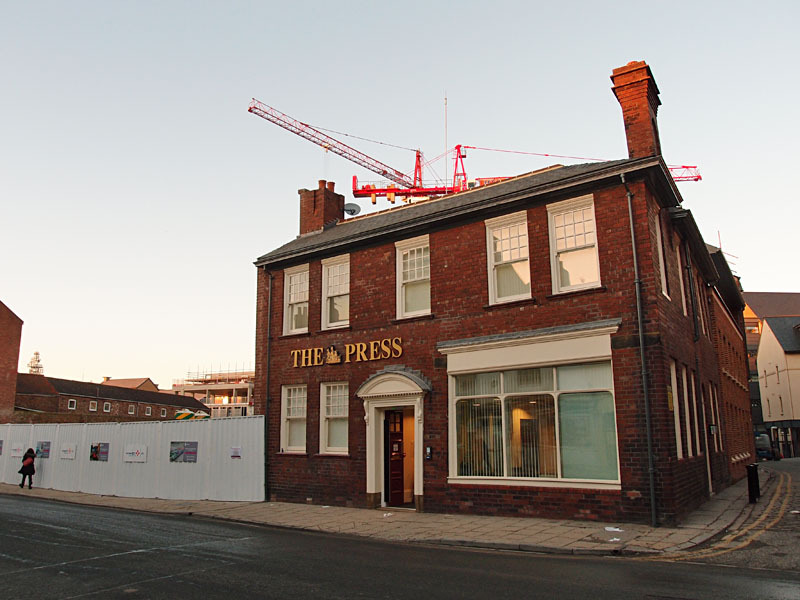 The Press in York is still an authority, an authoritative source, the place people still go to and rely on. But I wonder what it will be like in five years’ time. Perhaps by then we’ll be reading news on the Press website only after we’ve been forced to watch three video ads for cars. Or perhaps relying on ‘citizen journalists’ and hyperlocal bloggers.